Next time you're working on a wood project pay closer attention to the type of sandpaper you're grabbing. 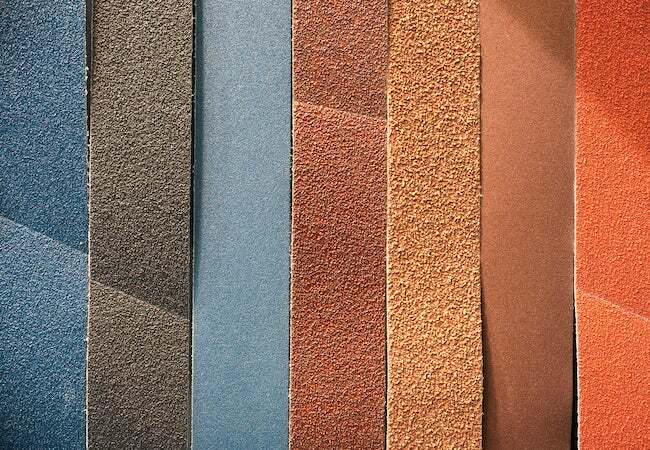 Sandpaper has different grit and coarseness levels that perform better or worse depending on the project. If you’ve ever worked with wood, you’re likely familiar with instructions to sand all edges after cutting, before applying a finish, between coats of paint, and so on. Not all sandpaper is the same. Each distinctly identified with a different set of numbered grits as well as a coarseness level, and different grits perform very different jobs. Keep these labels in mind when choosing one or more for your next project. Extra coarse s​and paper in the 24- to 36-grit range is the most abrasive stuff, so it’s used to remove stubborn paint and varnish or sand old floors. Coarse sand paper,​ which includes 40- to 50-grit, will roughly shape wood and remove previous finishes, such as light coats of polyurethane. Next, ​medium​ ​sandpaper,​ ranging from 60- to 100-grit, smoothes rough wood and removes planning marks written in pencil. Fine sandpaper​ ranging from 100- to 220-grit will suffice for final sanding before the work is finished. But still, there’s ​very fine and even ​superfine sandpaper, ​up to 600 grit,​ which are used between coats of paint or varnish.